Movie Review: Tom McCarthy’s “Spotlight” is flagrant, perfect, and essential. 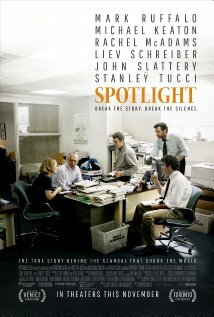 Mr. McCarthy’s fluid script was co-written with Josh Singer and interpreted in the best way by the glorious cast, conveying the journalistic effort that was put into this true investigation of the sexual abuse scandal in the Catholic archdiocese of Boston, carried out in 2002 by an investigative team of The Boston Globe known as Spotlight. The investigation unmasked several priests who sexually abused children during several years, and denounced the continuous cover-up of this sort of crimes perpetrated by the church, as an institution, in an almost unimaginable scale. All began with the arrival of a confident new editor to The Globe. Marty Baron (Liev Schreiber is outstanding), a Jew who had gained an excellent reputation in New York and Florida, knew exactly what he wanted when he politely urged the Spotlight team to consider picking this particular case. The tenacious reporters of Spotlight are chief Walter ‘Robby’ Robinson (Michael Keaton) who has some amends to make with his own past, the super-responsive Michael Rezendes (Mark Ruffalo), the efficient and temperate Sasha Pfeiffer (Rachel McAdams), and the restrained Matt Carroll (d'Arcy James), who got unsettled when he found out that one of the houses used for molesting kids was located right next to his place. All these members respond before the supervisor, Ben Bradley Jr. (John Slattery), who is presented as a minor key in the achievement. Sometimes agreeing, some other times arguing with one another to reach the best way for putting the truth outside without the interference of concurrent newspapers, the team wouldn't be succeeded without the priceless help of the righteous attorney Mitchell Garabedian (Stanley Tucci at his best), who had already started defending some of the devastated victims. Of course, there’s also a bunch of attorneys so-called ‘friends of the church’ who do everything to maintain the crimes unrevealed or to sweep the dirt under the carpet. Never exploitative and highly assertive in its unobtrusive approach, Mr. McCarthy, who won me over in the past with “The Visit” and “Win Win” but last year had a thorn in his side with “The Cobbler”, turned “Spotlight” into a masterpiece whose theme, even if not fresh nowadays, still has to be shouted out loud in order to alert and avoid future abuses. And… justice for all!